Crème de menthe is a mint-flavored liqueur that is very sweet and available in both white and green bottlings. Like other crème liqueurs, it is not creamy like "cream" liqueurs. Instead, "crème" refers to a higher amount of sugar used to make it. While not absolutely essential to stock in a bar, these liqueurs are nice to have around. At a price that is typically less than $10, it is an affordable addition that creates delicious, minty drinks. White crème de menthe is actually clear in color and the green is typically a darker green. These color options are important to consider when mixing cocktails and shots because some recipes rely on one color or another. Generally, creme de menthe is bottled at 25 percent alcohol by volume (ABV, 50 proof). This can vary from one brand to another. The ultimate crème de menthe cocktail, it's hard to resist the yummy grasshopper. This creamy martini is very popular and the perfect drink to mix up when you want to enjoy the tempting combination of chocolate and mint. A light drink, the grasshopper is made with green crème de menthe and crème de cacao. Add an equal pour of light cream and a luscious cocktail is yours to enjoy. For more casual occasions, there's also the grasshopper shooter that offers the same great taste. 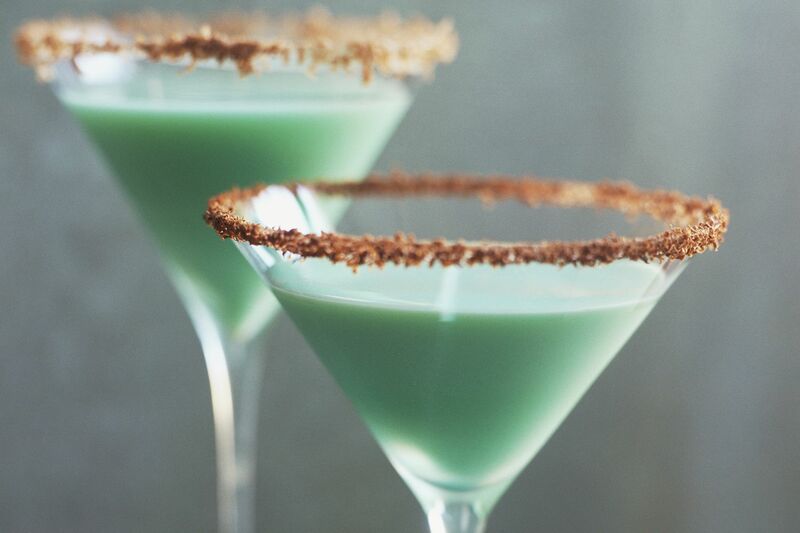 A modern twist on that mint-chocolate favorite, you're going to love the mint chocochata martini just as much (if not more). This dessert-worthy cocktail is easy, fun, and absolutely delicious. The recipe combines RumChata Cream Liqueur with your favorite chocolate vodka. With a little green crème de menthe, the drink becomes a beautiful, minty cocktail that's sure to be a hit. When you want to take the creamy green martini a step further, try the holiday hopper. Despite its name, it is a fabulous drink that can be enjoyed year round. This drink has the same creamy mint-chocolate base, but it adds a fruity touch. That comes from a shot of Midori, which ramps up the green color and gives the drink a gentle melon flavor. The taste is fascinating and worth trying. Just as popular as the grasshopper the peppermint patty also plays up the tempting flavor of mint-chocolate. It simply goes about it in a slightly different way. Though there are a few peppermint patty recipes, one of the oldest mixes white crème de menthe and white crème de cacao. It's served on the rocks, creating a smooth, refreshing sipper that's perfect for happy hour. Come winter, take your peppermint patty to the warm side and mix up a steaming cup of mint-chocolate cocoa. It's a comfort drink that is sure to warm you up on a cold day. The hot peppermint patty doubles up on both the mint and chocolate. Crème de menthe and peppermint schnapps are poured and the hot chocolate is enhanced with dark crème de cacao. Don't forget the whipped cream and shaved chocolate! For a minty hot chocolate recipe that doesn't require as many ingredients, the midnight snowstorm is an excellent choice. You'll need just three ingredients for the base, though a dollop of whipped cream should be considered essential as well. This recipe uses both green and white crème de menthe. The white goes into the drink with your favorite cocoa and the green is drizzled on top of the whipped cream for a fun, colorful finishing touch. Green crème de menthe is used more often than the white version simply because of its color. It's the key ingredient for countless green drinks and often found in the simplest of recipes. A perfect example is the Emerald Isle. This two-ingredient martini flavors your favorite gin with a hint of mint and a couple dashes of bitters. The flavor is intriguing and it may surprise you how well gin and mint work together. As you might suspect, the Irish eyes cocktail relies on a shot of Irish whiskey. It's creamy, green, and satisfying, the perfect whiskey sipper for St. Patrick's Day. Like most mint drinks, it's best to keep things simple and this recipe sticks to that rule. Combine your favorite Irish whiskey with green crème de menthe and cream, sit back, and enjoy. White crème de menthe has its uses as well. Quite often, it's poured into cocktails when you want the sweet, minty flavor without the extra color. Case in point, the classic stinger. This amazing cocktail is one of the easiest you can make. All you need is a good brandy and white crème de menthe. The pairing is fantastic and it makes an excellent dessert drink when you don't want anything too heavy. There's an unusual surprise inside the devil cocktail. It's one of those drinks that you simply have to taste because the flavor combination defies logic. Though it's served "up" in a cocktail glass, the devil cocktail begins with the brandy-white crème de menthe combo of the stinger. The kick comes in when you add a pinch of cayenne pepper. Really, you have to try it! The adventures in unique flavor combinations continue in the Irish pride. It's another recipe that has a taste that is difficult to comprehend at first, but many people find it quite delicious. In this recipe, you will pour a double shot each of green crème de menthe and amaretto. Top that with the tart citrus of lemon juice and you have a highball that you will not forget anytime soon. Party shots are another fun use for crème de menthe and, again, it's often the green liqueur that is poured for its appealing color. The Irish flag is a fine example of this and a fun drink to test your bartending skills. This triple-layered shot takes a bit of practice, but when the minty, creamy, orange drink hits your tongue, you'll know it's worth it. 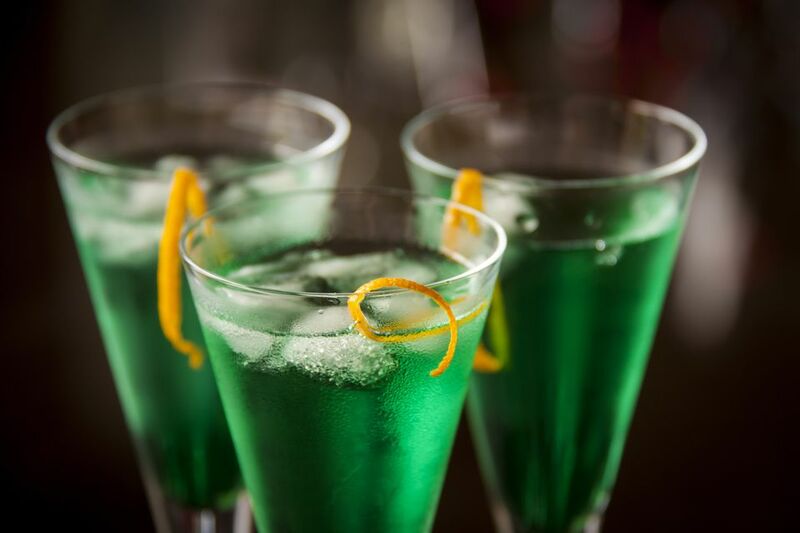 To make it, green crème de menthe is topped with colorful layers of Irish cream and Grand Marnier. What Makes RumChata so Special?